SyApps, LLC leverages a distinctive combination of industry expertise, technical depth and differentiated services to deliver the benefits of a world class Technology and Management consulting service to our clients. As a diverse end-to end IT and Management solution Provider, SyApps, LLC offers a range of expertise aimed at helping customers re-engineer and re-invent their business to compete successfully in an ever-changing marketplace. Enterprise Architecture Strategy, CFO/Controller Support, Data Warehouse and Business Intelligence, Package and Custom Application Development, Project & Portfolio Management, Technology Solutions, and Mortgage Consulting. 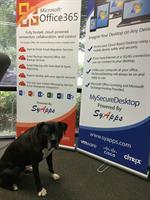 SyApps partners with and provides robust solutions leveraging industry leading organizations such as Microsoft, Citrix, Veeam, McAfee and Intel Security to meet all of your technology needs. If you are interested in learning more about our custom Managed IT solutions including hosting your applications in our secure data center, Microsoft Exchange Hosting, Office 365 or our own secure cloud based Desktop as a Service solution MySecureDesktop, please contact us. Located at Beaumont Business Center off of Hillsborough Avenue and the Veterans Expressway.